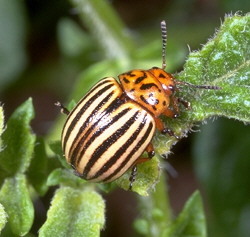 Though once found only in the western part of our country, the Colorado potato beetle (Leptinotarsa decemlineata), is well established and here to stay. In the South it is potatoes’ worst enemy; uncontrolled, these beetles can completely destroy a potato crop by stripping the plants of their leaves. Adult potato beetles burrow into the soil where they over-winter until late spring. Then they emerge, migrate to your potato crops, and begin mating. Eggs usually occur in clumps of 25 or so. For this reason, emerging larvae also appear grouped on plants where they have recently hatched. They crawl up on top of the leaves when it is warm and feed on the plants’ leaves. A voracious herbivore, this beetle not only targets potatoes but also feeds on tomatoes, eggplant, cabbages, and even tobacco! For these crops, the use of floating row covers (a breathable, lightweight fabric) may help reduce pest pressure on the potato plants. It also feeds on jimson weed, henbane, thistle, and mullein, so these weeds may or may not be effective in luring the beetle away from crops. Since this beetle is resistant to many commercial pesticides, you may find organic methods to be more useful. Appropriate crop selection is a great place to start. Several early-maturing potato varieties put on enough leaves before Colorado potato beetle populations explode and thus can better resist defoliation. These varieties include: Caribe, Norland, Pungo, Redsen, Sunrise, Superior, and Yukon Gold. Another control method is the use of wheat or rye straw mulches to restrict beetles’ movement into and through potato fields. Interestingly, research has shown that straw mulch also creates a favorable habitat for the beetles’ predators. 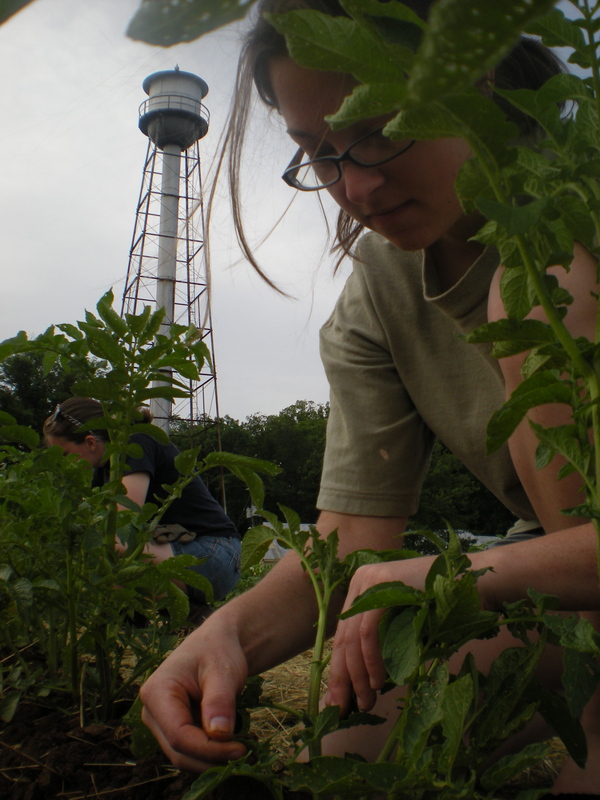 Certain plants such as catnip, tansy, and sage are believed to have some efficacy in suppressing Colorado potato beetle infestations, but research has yet to confirm their usefulness. 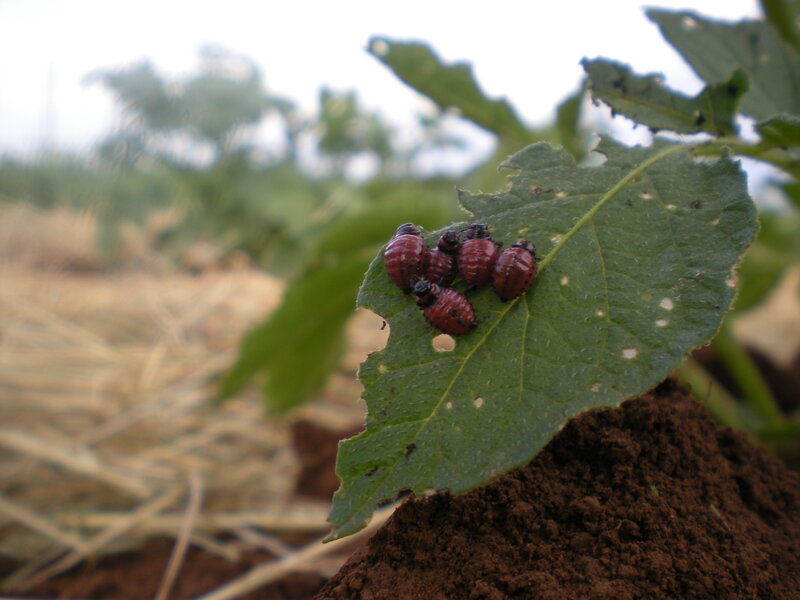 One of the best organic management plans for the Colorado potato beetle, though, is routine scouting. 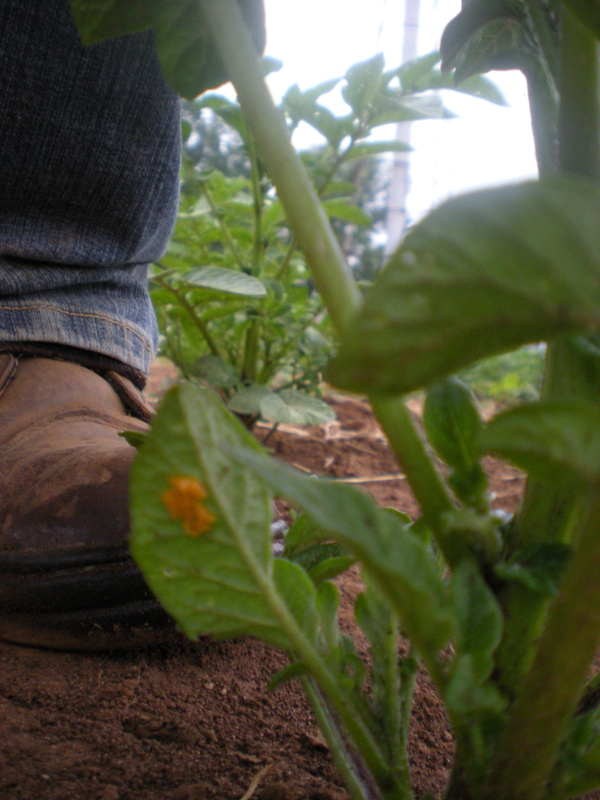 We spend time walking through our potatoes, looking for insects and the damage they inflict on plants. Often the damage is more visible than the pests themselves. They leave the tell-tale chewed up leaves. 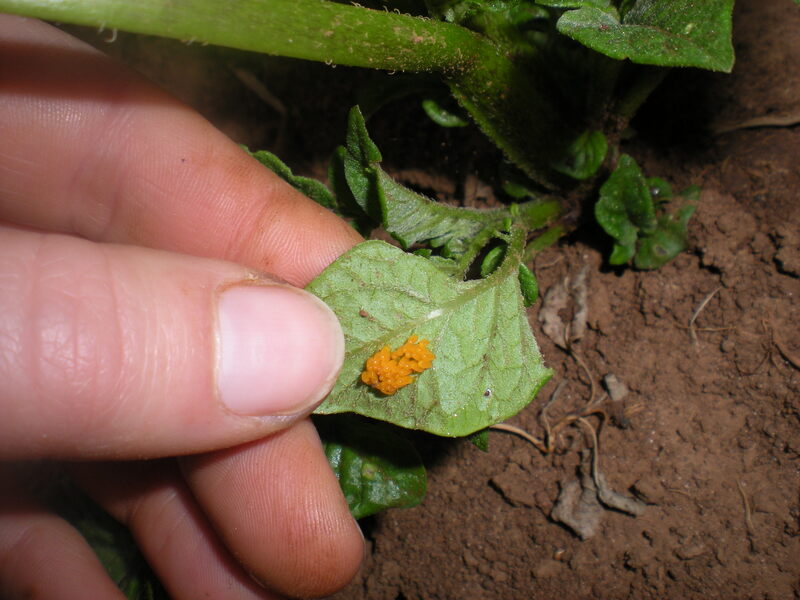 Turn over the leaves to find the bright yellow-orange colored eggs attached to the undersides. These are soft and crush easily between your fingers. Later, the larvae are a little bigger and juicier. Be careful! You might get squirted! This is a great stage to treat with an organically approved pesticide. It is best to knock them out at this stage of development, to prevent them from reaching the adult stage and breeding a whole new patch of trouble. Neem-based products such as Neemix™, BioNeem™, and Margosan-O™ have limited success. Caution should be used, though, since spray concentrations exceeding 1% can result in phytotoxicity on potato plants. Further, recent research has shown that neem products can be lethal to beneficial insects such as the ladybeetle, especially during their larval stages. Since Bt is only effective if ingested by the pest in its larval stage, it is important to catch them early. For these reasons, don’t go overboard with the sprays. Always follow the directions on the label and keep in mind that adult plants can tolerate a fair amount of insect damage to their foliage and still produce a terrific crop. Implemented correctly, organic pest control works well, and the results are healthy plants and delicious, chemical-free organic potatoes! Over the past few weeks I have had the pleasure of observing several species of birds out at the farm. I quickly found that the other interns were interested in learning their names and their songs, so I decided to write about birds and their contributions to gardeners. Birds are attractive and often fun to watch. They sing, forage, court, raise young, and can be seen doing all kinds of other interesting things. Several species are quite helpful in the garden. Insectivorous birds eat many times their own body weight in insects. Especially while feeding their growing hatchlings, parent birds pick off countless garden pests such as caterpillars, grubs, grasshoppers, aphids, and beetles. Besides the yummy fruits and veggies you’re growing, birdbaths, birdhouses, and flowering plants make your garden more appealing to wild birds. Food is important, and you should consider providing a food supply besides what you are willing (or unwilling!) to share from your garden. Birdseed is available in many different mixtures, but I have had the most luck with plain oiled sunflower seeds. Some birds have special dietary requirements. For example, goldfinches love thistle seeds and woodpeckers like suet, a mixture of seeds pressed into a brick of fat and hung up in a tree or laid on a birdfeed table. Consider making your own feeders by reusing plastic bottles (e.g. soda, milk, or detergent bottles). Be sure to rinse these first, and then look for patterns online. 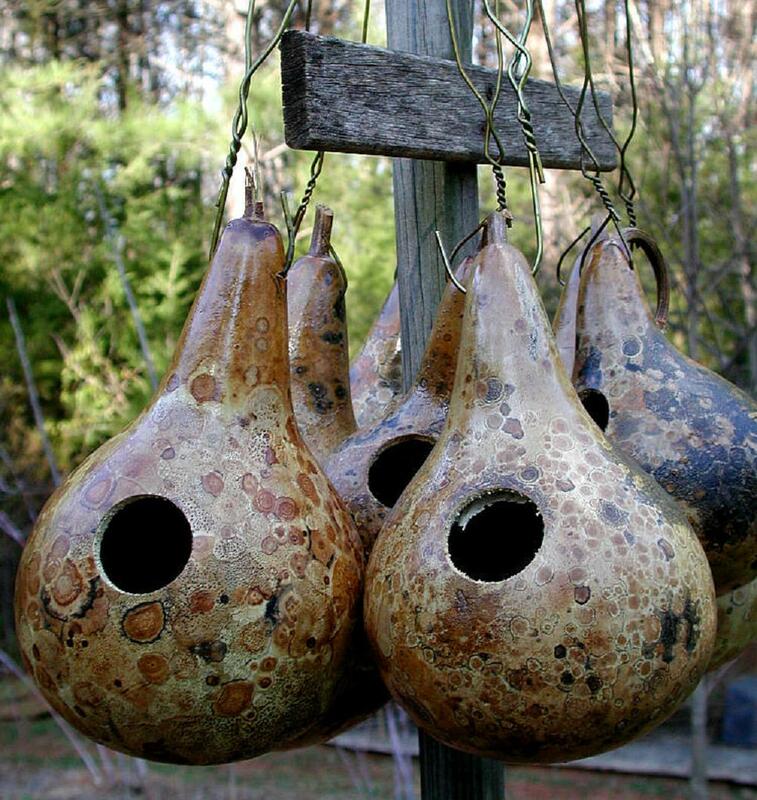 These recycled bird feeders are low cost and make great craft projects for children. Birds will need a source of water, too, so if your garden does not include a nearby stream or pond, you should invest in a birdbath of some kind. This may be as simple as a hefty ceramic bowl or as intricate as an electric or solar powered fountain whose splashing water attracts birds. Be sure to change the water frequently to deter mosquitoes and to prevent algae build up. To ensure that your garden birds stick around, you should put up birdhouses to provide shelter and nesting areas for them. Look at the many different birdhouse patterns available and consider which birds you want to set up house in your garden. 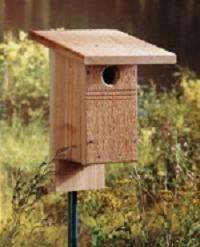 You can attract many different wild birds as long as you provide just the right design for them. Eastern bluebirds, for example, do not like a large front door that allows predators such as squirrels, and other birds such as starlings, access to the nest within. These intruders often gnaw soft woods to widen the openings on birdhouses, so look for building materials that prevent this. 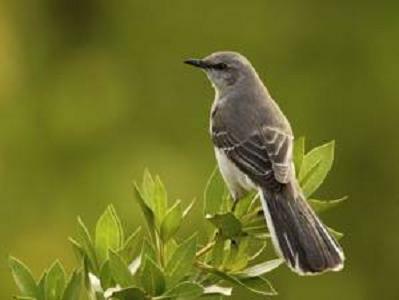 Most birds will leave plants alone, preferring instead protein-packed insects. Sharp-eyed bluebirds and crows pick off grasshoppers, and wrens, especially, eat a wide variety of insects. Robins feed on many insects, caterpillars, and grubs. Sparrows mostly eat seeds, but they will also pick insects off of your vegetables and flowers, and starlings often search the underside of vegetable leaves for grubs. Though primarily known for their love of nectar, hummingbirds also eat fruit flies, gnats, and aphids. 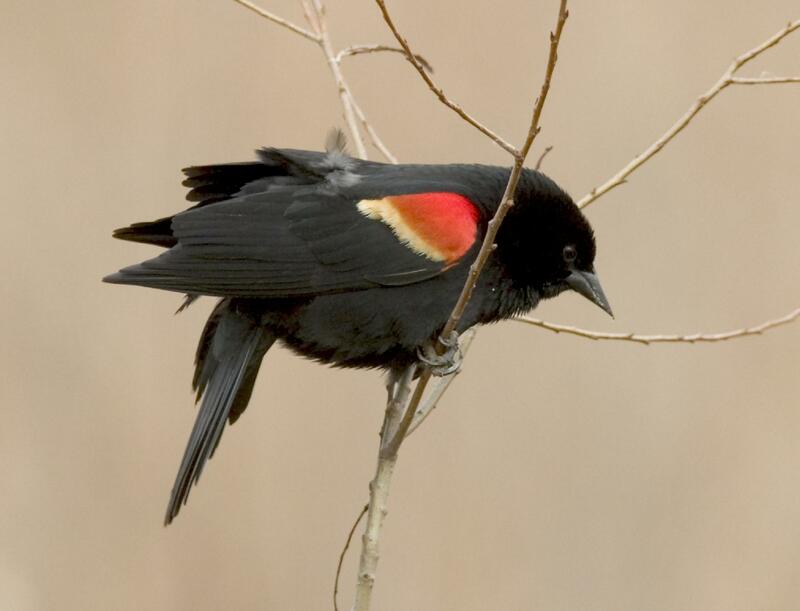 Some species, like blackbirds, however, are such enthusiastic hunters that they may tear up your garden mulch looking for insects. Despite the many advantages of these avian visitors, sooner or later your interests and the birds’ interests may conflict. At that point, bird pest control may become necessary. There are many visual scare tactics for natural bird control. A good old-fashioned scarecrow works well. Or you may consider a few well-placed decoys shaped like predatory birds (ex: hawks or owls) or a cat. A toy snake will work in a pinch. You can also string up shiny objects whose movement in the wind and light reflection scares away birds. Be creative. You can use old CDs, recycled pie tins or other household items. Physical barriers may be necessary in some cases. Bird netting can keep unwanted avian intruders away from your fruits and veggies, but be careful that fine meshes don’t get tangled in birds’ feet. This week we were very artistically inspired. 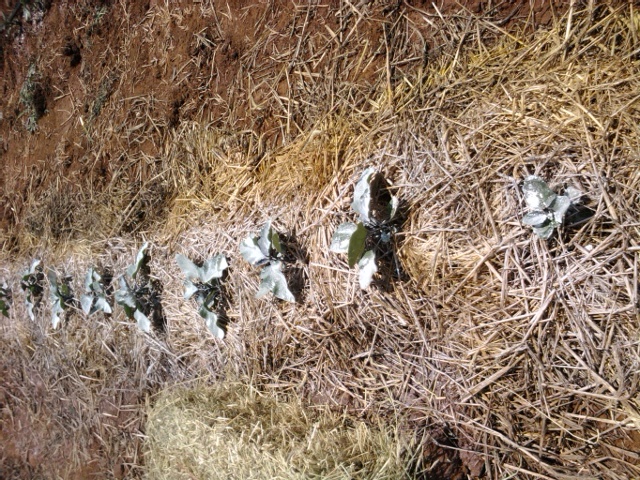 We thought that it would be a good idea to spray paint each row of vegetables in the garden. Why did we spray paint all our plants, you may ask? Well, let me tell you. What looks like crazy white spray paint is actually an even crazier thing called diatomaceous earth. 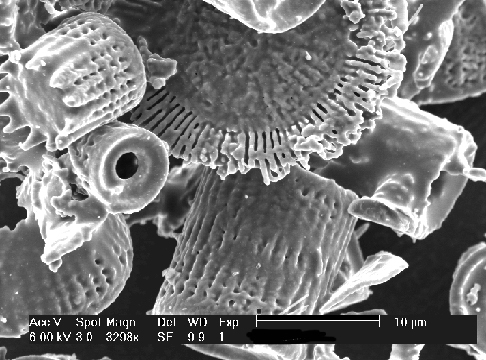 This is a powdery substance is sediment composed of diatoms, teeny tiny little algae. It is essentially a powder of microscopic fossils. Why do we put microscopic fossils on our plants, you may ask? Well, let me tell you. In our garden, we carefully scout for pest bugs. We have put time, love, and sweat into growing our veggies and don’t want them to get eaten up by anyone but us. This week we noticed that squash and cucumber bugs were starting to become a problem among the squash and melons, so we took action! 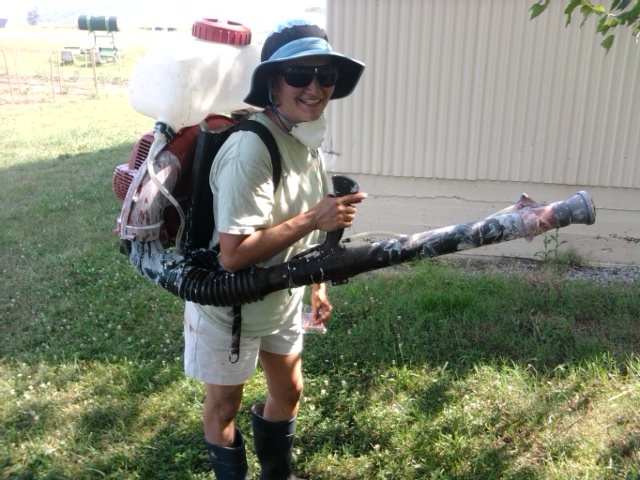 Tiffany, spraying diatomaceous earth. Squash bugs, run for your lives! This “earth” is not friendly to bugs. When an insect touches it, the powder dehydrates the exoskeleton, eventually killing the insect. Ow. Though this sounds like a harsh substance, insects are the only ones to fear from it. We are 100% certified organic in the garden and use diatomaceous earth as an approved organic form of pest control. When you get your zucchini in a few weeks, say a little thanks to the weirdness of the diatom fossils that have protected our plants! Eggplant covered securely with DE. Yesterday at market, we interns had a tough time keeping our noses out of the basil we had harvested earlier in the day. Folks, this basil is NOT your typical basil. This basil is THAI basil! The standard basil that you’re used to is sweet Genovese basil, used most commonly in Italian cooking. Thai basil is a variety that is used more in Asian cooking. 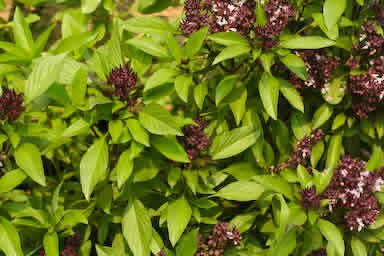 It has green leaves beautifully veined with purple and its flowers are also a deep purple. Its taste is more layered than that of sweet basil, with a hint of licoricy-spice. This year we have also grown Genovese basil and a lemon basil variety. There’s no such thing as too much basil. 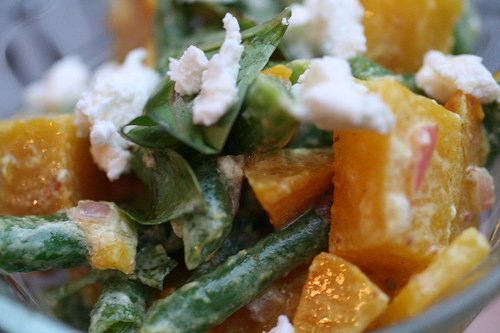 Not only is it delicious, but fresh basil is said to have antioxidant and anti-inflammatory properties. 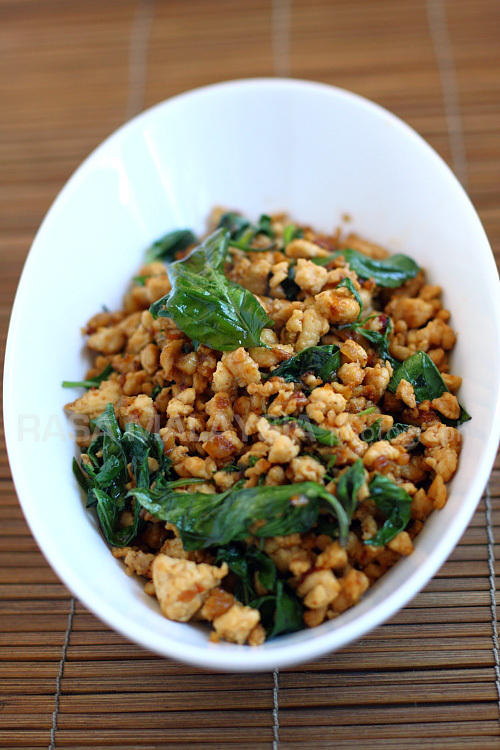 Click here for a lovely recipe for Thai Basil Chicken. Come by our market next week to pick up some of this amazing herb! Today when you pick up a bunch of beets from the UT Harvest Market, PLEASE don’t throw away the tops! Eat them, too! Beet greens actually contain even more nutritional value than the roots. And they are absolutely delicious. Some folks grow beets just for the baby greens, which are a wonderful addition to a spring salad. Get the most out of your bunch o’ beets by cooking one of the following dishes that includes both roots and greens. It’s the best of two worlds – both above the ground and under it! A side note about our beets from the UT Market Garden – you will see that we have grown the “standard” beet, dark red with red-veined tops. In addition to the standard, we also have golden beets and Chioggia beets. Both kinds are milder than the standard. Golden beets are gold all the way through and Chioggias can be cut open to reveal a red and white “bulls-eye” pattern inside. Just lovely. These beets can be used in any way you would use a standard red beet, though in my opinion the golden beet has the finest flavor of them all. With all of its tents and lights and amazing music, Bonnaroo has definitely won its way into the hearts of music fans world-wide. Music festivals are always such great events that draw eager crowds– but music festivals are not alone. Increasingly so, famer’s markets have been cropping up nation-wide and creating a hype all their own. And the best part? They happen on a weekly basis! Every year at the opening of the Farmer’s Market in April, loads of eager potential customers are wondering: “Where are the tomatoes?” “Where are the sugar snap peas?” “Where are the peppers?” There is no denying that there are certain foods that draw people to Farmer’s Markets– even though it’s not always seasonal. The same thing goes for music festivals– your favorite band will not play all the time. However, when they do show up eventually (the tomatoes, sugar snap peas, and the headliners), they hardly disappoint. Music festivals have a variety of music to appeal to many different crowds. They’ve got old favorites as well as new, up-and-coming bands looking for exposure. Hopefully, if you look around enough, you might find something that you like. So, you didn’t the tomatoes you came for. They’ll be out in a couple of weeks. However, this fantastic lady a couple of booths down introduced you to kohlrabi– a sweet and tender vegetable that tastes like broccoli. And your family just happens to enjoy it for dinner. You see, if you look around at what is out and on show, it will be hard to leave empty-handed. What is a festival without tents? A place to step out of the sun and mingle with people who just happen to be around you at the time. Farmer’s Markets work the same way. People travel from within the area to come sell at local Farmer’s Markets– they’re locals. They could very well be your neighbors. Farmer’s Markets afford opportunities for people to come together over the long-lasting bond of great food right within their own community. And… sometimes, it’s good to take a step out of the sun. Farmers, like rockstars, like to show off a bit. While they say that rockstars perform better while in a live show, feeding off of the chemistry of the audience, farmers use their talents for producing high-quality fruits and vegetables and like to put their best and most nutritious foot forward. There is a certain connection with growing one’s own food– you begin to know it a little more and treat it with care. If you have any questions about the produce on the stand, don’t hesitate to ask the farmer who grew it. Just as bands travel from near and far, farmers do as well. Depending upon the size and the draw of the market, farmers will come from within a 50-mile radius to sell their wares. Usually bands have a little more flexibility with travel– but I imagine that a guitar travels better than a pint of strawberries. 6. Things get a little dirty. While Farmer’s Markets may not exactly have a mud pit, in which people are thrown around and proceed to mosh, farming is not easy or clean work. Between all of the sweat and mulch and mud and all else associated with farming, there is no neat way around it. Remember: food does come from the earth. 7. The sense of community. Music and food are two great things that do something unique to mankind: they bring us together. Commonalities can be found in these gatherings and differences can be discovered and explored. It make the community tighter-knit and we all leave with a couple of new friends at the end of the day. Make Your Own Sunshine Preserves! In Tennessee in the summertime, there is one thing we have no shortage of: the sun. While the sun is helping our plants grow healthy and strong, here is a fun (and tasty!) way to utilize the sun’s energy this summer. It’s also a great way to take advantage of the fact that strawberry is in full swing! – The key to making good preserves is to utilize equal parts fruit and sugar. – Slice the strawberries into fourths. – Put the fruit in your preserving kettle in layers. Make your first layer of fruit just barely cover the bottom of the kettle. – Then, layer a sprinkling of sugar over each layer. – Keep alternating the layer of fruit and the layer of sugar until you run out of fruit. – The fruit and sugar should be no more than 4 inches deep. – Place the preserving kettle on the stove and heat slowly to the boiling point. – When it begins to boil, skim the foam off of the top. – Boil for ten minutes, starting from when the fruit begins to bubble. – The fruit will plump (due to its natural pectin) and the syrup will thicken into a jelly. – Put the preserves (cold) into a glass jar. They should keep for about 2 weeks in the fridge. I love farmer’s markets. They’re always like music festivals. They have a bunch of old favorites to draw the crowds. Each vendor parades his or her rockstars at the front of their booth, proud of the hard work they’ve put into their wares. And then you’ve got the super-strange new-fangled artists that you’re never really sure which genre their music fits into. Is it blues? Jazz? Americana? Kohlrabi, also known as a “German Turnip”, translates roughly into “Kohl” (German for “cabbage”) — “rabi” (which is Swiss-German for “turnip”). It is a cultivar closely related to the cabbage, and is referred to as a turnip because of its bulbed root, which resembles the root vegetable. 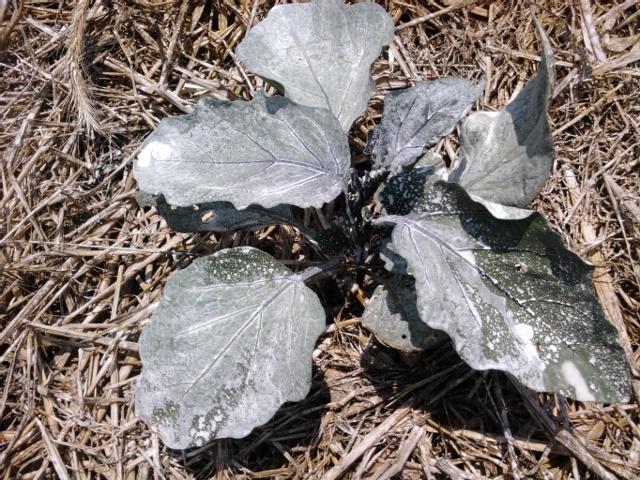 It is a cool-weather loving crop sown traditionally in the spring. It takes about 40-50 days before it is ready for harvest. You harvest by cutting the root out of the ground just below the bulb. Wash thoroughly and remove the greens on the outer rim of the bulb, so it resembles a turnip with several (8-10) greens growing out of the top. 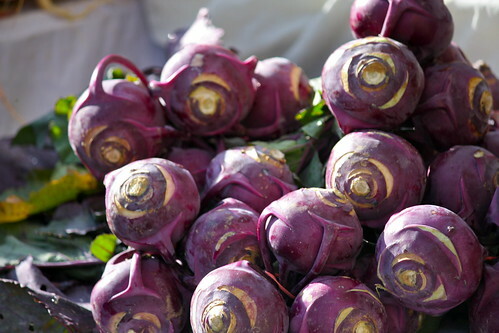 Now that we know what kohlrabi is– what do we do with it? Personally, I like to prepare it raw with hummus. Just chop up the bulb into strips, saving the greens for future braising, and dip the strips into the hummus and enjoy. Yum! However, for those of us who like a bit more of a challenge, here is a Mexican recipe for Kohlrabi and Squash Empanadas. In a medium skillet, heat oil and butter over medium heat. Add garlic and ginger to brown. Add kohlrabi cubes, a pinch of salt and some pepper. Toss well and cook 3 or 4 minutes until kohlrabi are softening a bit. Add squash cubes and continue to cook for 4 more minutes. Add scallions, radish, nutmeg and another pinch of salt and pepper. Mix well and cook for one minute before removing from heat. Set mixture to this side to cool. Roll out dough to be a little thinner than pie crust typically is. If you are using pre-made crust from the store, run your rolling pin over it once or twice. Using a cereal bowl or large circular cookie cutter, cut out 6 inch-ish circles from the dough. It should yield about 15, give or take depending on your cutter and dough thickness. Pre-heat oven to 425F and line a cookie sheet with parchment paper. Prepare egg wash by beating egg with a teaspoon of water and set to the side along with a small bowl of water. To make the empanadas, spoon one tablespoon of kohlrabi and squash mixture into the center of a circle of dough. (It’s better to have less filling than too much or the empanadas won’t hold together. Feel out the right ratio that allows you to close off the dough without any filling popping out.) Dip your finger in the bowl of water and run it around the outside edge of the dough. Fold dough over the filling to create a half circle. Press down edges. Carefully pick up the dough pocket and pinch edges (see photo) to seal them tightly. A fork can also be used to crimp the edges if you want a less tedious method. Repeat above process to finish all the empanadas, laying them on the lined cookie sheet when done. With a fork, prick the tops once and brush with egg wash. Bake for 8 minutes and turn over. Bake another 5 to 7 minutes until deep golden brown and flaky. Best served straight from the oven. As we’re all sitting down and taking a lunch break this week, we’re talking about birds. Which birds signify the coming of a storm. Which birds follow the lawnmowers and tillers to pick up the unearthed insects. And crows. Crows and sparrows and other such birds have been known to feed on recently cast seeds and newly budding fruits– the nightmare of many a vegetable farmer. One way to easily deter these pests is with a decoy known as a “scarecrow”. Constructing a scarecrow in the form of a human being is advantageous to keeping them away from your garden. Scarecrows work mainly because they take shape of a bird’s enemy: the human. When a bird sees a human form in a garden, it flies the other way. Movement also scares birds away. It is not uncommon to see ribbons or other loose ends hanging off of a scarecrow because they move with the direction of the wind. Any sort of loose clothing blowing in the breeze is more likely to frighten them than stationary clothing. If the birds see a stationary figure in a field for a long time, they are likely to become not afraid of it. If it is regularly moved to different locations, the birds are led to believe that there is a moving human being in the garden. Birds are terrified of sounds. This is why many scarecrows have tin pie plates utensils hanging from their arms. When the items clash, the noise startles the birds. One effective method of scaring away crows is using “rubber snakes”. These can be made out of old garden hoses placed in “S’ formation on the ground by your seeds. Another more unconventional method (as discussed around the table) was the use of a concrete cat. While the principle behind the cat moving in the garden would work for scaring birds away, we each chuckled at the thought of a farmer dragging a concrete cat through his garden. What am I going to do with all of this CHARD? It’s late May and the first Harvest Market of the season was a huge success! We had Elita Lettuce, Marvel of the Four Seasons Lettuce, several different types of kale, and something I had never heard of before: Swiss Chard. We had two different varieties of Swiss Chard: Rainbow Swiss Chard (which we lovingly dubbed “Double Rainbow Swiss Chard” after the endearing and INTENSE Youtube Video), and Chadwick’s Choice Swiss Chard. If you’re curious as to what Swiss Chard is, it is a leafy vegetable with a stalk that resembles beet greens (except some varieties have almost technicolor stalks). Bring a stockpot of salted water to a boil. Add the chard and cook for 1 1/2 minutes. Drain and cool to the point where you are able to squeeze the water from the leaves. 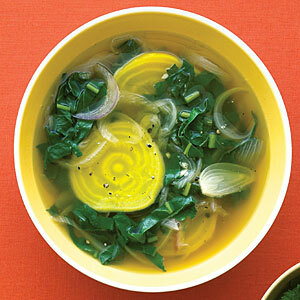 When you have removed as much water as possible, set chard aside. Heat the olive oil in a large saute pan over medium heat. Sweat the onion until translucent, 5 to 6 minutes. Add the tomatoes and chard and cook for 2 to 3 minutes. Stir in the cream and cook for one minute more. Season with salt and pepper. Heat the olive oil in a skillet over medium heat. Stir in the onion; cook and stir until the onion has softened and turned golden brown, about 10 minutes. Add the garlic and red pepper flakes, stirring until fragrant, about 1 minute. Stir in the chicken broth, Swiss chard, and salt. Cover and reduce heat to low. Simmer until chard is nearly tender, about 5 minutes. Remove lid and increase heat to medium, stirring until the liquid evaporates, about 5 minutes. Remove from heat and set aside. Heat another skillet over medium-high heat. Warm the tortillas in the skillet for about 1 minute per side. Fill the warmed tortillas with the chard, and top with the queso fresco cheese and salsa. The last recipe I am going to share with you all is one that one of my fellow interns, Kathryn came up with (which I tried out tonight– and it was delicious!). First, you take a couple of leaves of Swiss Chard and cut off the ends. Tear it like you would tear lettuce, into bite-sized pieces. Heat a skillet with a tablespoon of olive oil on medium. Mince one clove of garlic and add it to the olive oil. Meanwhile, heat a stock pot of water to boiling to make pasta (I used vermicelli). Add the chard to the skillet with the oil and head for 2-3 minutes. Then, add a fair amount of your favorite spaghetti sauce (Ragu is a good choice) to the skillet and simmer on low. Boil your noodles for 7-8 minutes and drain. 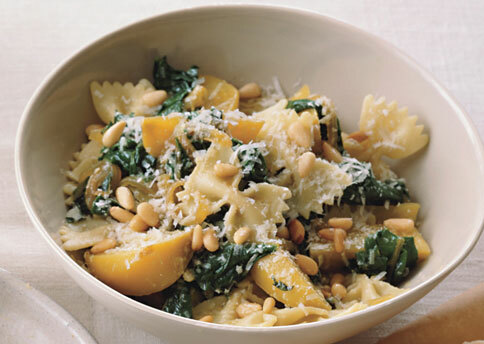 Serve the spaghetti sauce and chard over the hot noodles and enjoy!